Esau Karuru Born in 1979 in Mashonaland West, where he attended primary and secondary school. Esau started his life in the Shona art world first as an assistant to Witness Bonjisi, his brother Lameck and finally Colleen Madamombe in 1997. Just one year later, he had the confidence to become independent and since that time he has sold his art to buyers from all over the world. 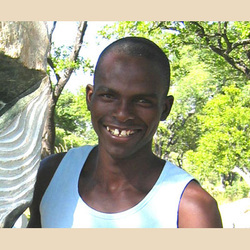 His goal is to be a recognised and respected sculptor. In 1999 Esau married Shupikai and they have a girl, Tanyaradzwa.